Pantai Cenang is the most popular beach area in Langkawi. And as expected, there are numerous small to large operators here, some of who have kiosks right on the beach and offering all kinds of water based activities like jet skiing, banana boating, speed boat etc. 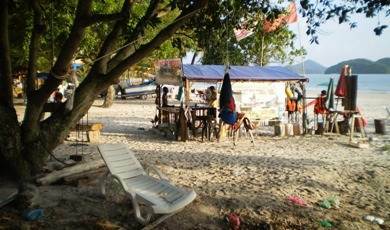 As you walk along the road Jalan Pantai Cenang, you will see outlets and stalls of these operators offering many different packages for island and boating tours, as well as for the watersport activities. Many disguise their real identity with a large board saying "Tourist Information Center"... to attract tourists. Although they do help tourists with basic information, their main intent is to sell their tours and activity packages. So don't expect to be entertained for long if you show no interest in their offerings. Other than beach and watersport activities, there are several other great things to do in Pantai Cenang area. The area is full of great Spas offering traditional massages and treatments. There is a Kids Club in Meritus Pelangi Beach Resort offering children several nice activities. There is also a Karting center in Pantai Cenang. There are numerous operators offering water sport opportunities on Pantai Cenang beach. The activities include Jet ski tours, water ski adventure, kayaking, speed boat joyrides, banana boating etc. However note that several of them are not licensed, have poor quality equipment and do not follow even the basic safety guidelines. I strongly recommend that you avail service from one of the well known operators even though you might need to pay a little more. Here are some of the operators we like the most. They are one of the finest operators with uncompromising focus on safety and offers most of the above watersport activities. Their focus on details and quality of guides are exceptional. They are located on Pantai Cenang and behind the Tomato Nasi Kandar. They specialize in Jet Ski tours. Their Island Hopping tour has been one of the best offered in Langkawi. The operator follows the guidelines of Responsible Tourism with immaculate focus on safety. They too are located in Pantai Cenang. While most operators take you to Pulau Payar Marine Park for a dive, there is one with a small kiosk right on the beach that also offers dives at offshore water locations near the Cenang beach and from their own small dive boat. This can not only save you an awful lot of time, but also give you a great experience with personalized guidance. The operator is Langkawi Scuba. The partners are both PADI Certified. You will get their offerings and contact information here. They are one of the best Eco Tourism companies in the island and organize several nature tours including nature cycling trips, mangrove kayak & boat trips, jungle treks, bird watching, morning & evening walks etc. Note that para sailing at Pantai Cenang beach by taking off and landing at the beach has been banned by the town council. There have been several serious cases of accidents and injuries that have taken place at the beach. There are coconut trees, barbed wire fences, overhead electrical lines and resorts buildings along the beach which make it extremely dangerous for para sailing activities here as the parachutes may get entangled or hit such obstructions. Para sailing by launching and landing at the boat is only allowed and that too in safe water area. This requires boats that are designed specifically for such activity with necessary equipment. Most operators do not have such boats. Despite being illegal, there are several unscrupulous operators who continue to offer para sailing at the Cenang beach by following a crude method of launching and landing at the beach itself. Most don't even know how to take the basic safety measures and have boats unworthy of supporting such parasail chutes. I would strongly advise you to stay away from them and not to undertake such dangerous and illegal activity. Having said that, here is one operator who is licensed and offers parasail from a boat at Pantai Cenang. The boat is equipped with parasail gears. You don't get wet at all. You will be launched and landed at the boat. The para sail can carry up to three people and has all safety gears including harnesses to fit your size and life jackets. You will float in the sky some 500 feet above the sea and get a bird's eye view of the area. There are several great spas located in Pantai Cenang including budget, heritage and boutique spas. Here are some of the best ones. The Pantai Cenang branch is Located opposite to Casa Del Mar Hotel. They offer over 30 treatments and traditional massages using natural in-house ingredients. You can also buy their essential oils and other Spa products. It's located in natural scenic setting within the Laman Padi rice museum complex. From some of the cabins you can see the paddy field and buffaloes grazing the fields. The Spa offers unique Malay treatments that are hard to find anywhere else and use the herbs and spices from the herbal gardens in the complex. It's located at the junction where the road Jalan Pantai Cenang meets Jalan Pantai Tengah. They offer a series of packages with combinations of oil head massage, body massage, hair treatment, facials, flower bath with milk, body scrubs and more. They have coupe of outlets. Thai Spa1 is next to Malibest Resort and Thai Spa2 is opposite to the Melati Tanjung Motel. As the name suggests, the Spa offers traditional Thai treatment and massages including Thai herbal massage, waxing, Shiatsu, reflexology etc. These are great for instant relief and relaxation, and offered at reasonable rates. It's located within the Meritus Pelangi Beach Resort and considered one of the heritage Spas. Located in a village setting and within lush green gardens, the spa offers variety of Asian treatments including ancient Asian spa rituals, facials, organic skin care, manicure & pedicure, and lot more. They also offer special spa concoction drinks. This is a boutique spa located within the Casa Del Mar hotel. Every treatment is fine tuned towards one's individual needs and delicately applied taking care of every possible detail. The theme is on traditional Malaysian therapy and healing. Fresh tropical ingredients and oil are used in the treatments. 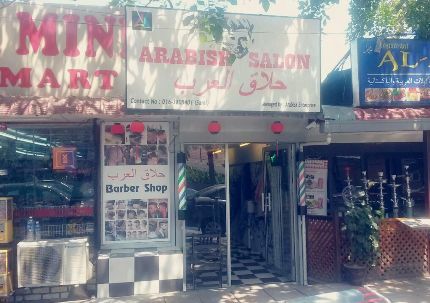 A men's salon located opposite to Casa Del Mar Hotel on Jalan Pantai Cenang. 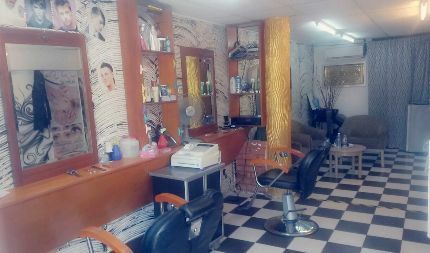 Services include hair cutting, washing, hair coloring, hair treatment, rebonding etc. Owner: Norhaliza Binti Ramli. Address: Lot 17, Jalan Pantai Cenang, Langkawi. There is a Karting center in Pantai Cenang Langkawi. You can Kart on a 1230-meter long track. The track has been used twice for Rotax World Finals in the past. There are one-seater and two-seater karts available, both with 4 Stroke engines and with a max speed of 80 kms per hour. Free instructions and helmets are given. Rates: Single Seater RM37 for 10 minutes. Double Seater RM60 for 10 minutes. Lot67, Jalan Pantai Cenang, Langkawi. The Kiki Children's Club is located at the Meritus Pelangi Beach Resort & Spa. The kids would love to spend their time here with so many activities like face & T-shirt painting, getting swimming lessons, participating in art & craft, mini golfing, learning the Malaysian Language Bahasa, making kites, fishing and lot more. Although the club is accessible to the guests of the resort, children of outside guests can also avail the facilities by buying special passes. The club is open from 9am to 9pm. Phone: (604) 952-8888 (Ext. 5). 2) Pantai Cenang Area Guide: All information about Pantai Cenang including attractions, activities, hotels, restaurants, shopping etc.